Dutch artist Louis Raemaekers, described as the “supreme cartoonist of the war", used his pencils as a weapon to create powerful impressions characterizing and criticizing the nature and legacy of war. Born in the Netherlands in 1869, Raemaekers’s first wartime political cartoon was published in the Amsterdam newspaper De Telegraaf on 1 Aug ust 1914, following the German declarations of war. As is true with today’s political cartoonists, Raemaekers infused religious sensibility and symbolism to develop both comical and stirring commentary on the brutality of war and its destructive legacy. Caricatures of leaders, particularly Kaiser Wilhelm, personified the reprehensible practices of war conducted by Germans while portraying empathy that defied national borders. Between 1914 and 1918, Raemaekers’s works were printed in newspapers worldwide, reproduced on millions of postcards, published in dozens of books, and exhibited in hundreds of cities around the globe. Raemaekers received unprecedented attention on both sides of the Atlantic, was awarded the Legion of Honor, and received credit for influencing the U.S. decision to enter the war. In one of Raemaekers’s most famous images, he uses a simple composition to deliver a powerful critique of war and to undermine notions of Europe’s perceived progress. 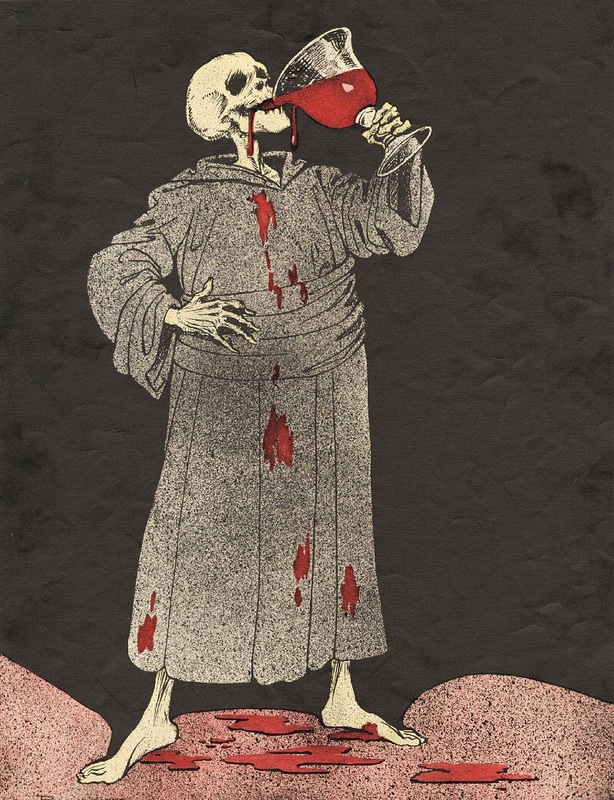 The figure of Death drinks from an oversized goblet of blood with which he has toasted Civilization. In Raemaekers's depiction, Death is fattened on Europe’s “civilized” modern warfare. 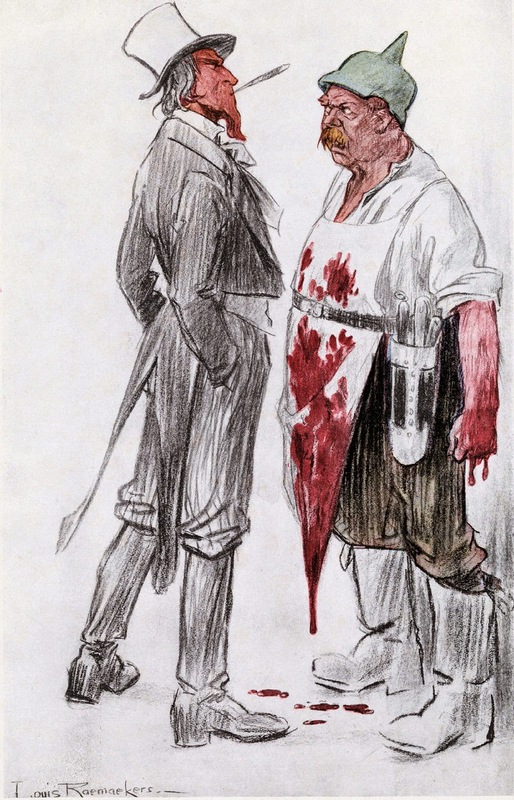 Devoid of national marker, this cartoon points to the shared guilt of European political leaders who, with “enlightenment” and prosperity, started a war that quickly spread across Europe and the world, unleashed massive armies bristling with weapons, and sacrificed millions in the name of enlightenment and national honor. Almost two years before America's entrance into World War I, Raemaekers’s cartoon published in July of 1915 (alternately titled "The Submarine Butcher") depicts a standoff between a bloody German butcher and a defiant Uncle Sam. The Germans implemented a policy in 1915 of unrestricted submarine warfare on all Allied ships carrying war material, but their policy also put neutral U.S. ships and citizens at risk. The dripping blood represents a series of German submarine attacks on British and U.S. ships carrying American passengers, which sparked a crisis between the U.S. and Germany. Most shocking was the sinking of the British passenger liner Lusitania on 7 May 1915, which killed more than 1,200 civilians, including 124 Americans. The Germans claimed that the ship was carrying war material and, by the necessity of war, had to be attacked. Although the public was not informed at the time, the ship was indeed carrying rifle cartridges and empty shell casings. Thanks to Mike Vietti of the National World War I Museum for these images and comments. My recently published book on Cigarette Cards & World War One has a significant portion of the chapter on the Humor of the War devoted to Raemakers Cartoons. The cigarette card set of his cartoons, issued by the cigarette company, Carreras, has 140 of his cartoons illustrated and described.